The beautiful weather we’ve been waiting for is finally here! 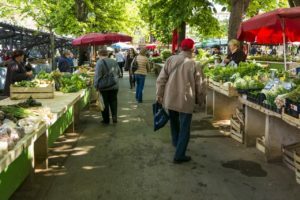 With spring and summer comes the return of area farmers markets, perfect for purchasing fresh, local produce, meats, honey and more from area farmers. When you shop local, not only are you getting fresher, better-quality foods, but you’re also giving back to your local community. It’s a win-win! Check out our listing for fresh shopping around Northern Virginia. Gainesville Farmers Market – Looking for a mid-week pick-me-up? Gainesville’s got it! Every Thursday from 2 until 6 p.m., from May through September, you can shop this seasonal farmers market. It is located at 13550 Heathcote Blvd., Gainesville, VA.
Haymarket Farmers Market – This market is now a year-round market! You can purchase local fruits, veggies, fresh flowers, bedding plants and decorative items. 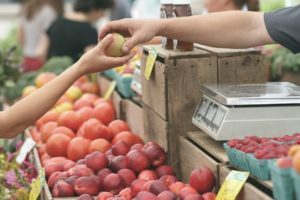 During peak season (starting April 6th), the farmers market can be found on Thursdays in the Harris Pavilion in Historic Downtown Manassas and Saturdays in the new location — Prince William Lot, across from Baldwin Elementary. The hours for both markets are 7:30 a.m. to 1 p.m. Both markets will run through mid-November. All vendors sell only Virginia-grown products, so you can rest assured your money is going back into the local community. Historic Manassas Farmers Market – This farmers market was voted one of the best by Prince William Living Magazine. Starting in April, the farmers market is open on Thursdays in Harris Pavilion in Historic Downtown Manassas. Saturdays the market is located in parking lot B behind the Harris Pavilion from 7:30 a.m. to 1 p.m. The summer Tuesday evening market will run from June through August at the Harris Pavilion from 5-8 p.m. The Winter Market is held on Saturdays in Parking Lot B beginning in December. What a great way to have fresh produce all year long! The Community Farmers Market in Fairfax – Featuring both Saturday and Sunday markets, The Community’s Farmers Market was voted one of the top three markets in Virginia by Virginia Living Magazine and one of the top 10 in the D.C. area by the Washington Business Journal. It’s definitely one to check out! Markets are open from May to October, with Saturday hours of 8 a.m. to 1 p.m. and Sunday hours of 10 a.m. to 2 p.m. The Saturday Community Farmers Market is located at 10500 Page Avenue — one block from West and Main streets behind the Wells Fargo Bank and adjacent to the Historic Fairfax County Courthouse. Loudon Valley HomeGrown Markets Cooperative – This cooperative group features markets throughout the Loudon County area on various days of the week. Markets run from May through October, with a full listing available on their website. Need a little extra time to browse the local goods at the market? Create some quality time for yourself by hiring a personal assistant. We can take care of your day-to-day errands, freeing up time for you to shop for local, healthy produce and support our local farmers. Give us a call today to get it scheduled!